The Kiwi's bolstered the Tigers by 3-0 in the one-day international series and they will look to continue their juggernaut against Bangladesh in the longest format of the game, As of now, New Zealand will invite the Asians for the first test of three game series to be played between February 28 and March 4 at the Seddon Park in Hamilton. The Kiwi's hold a dominant test record against Bangladesh, having never lost a single test against the opponents and after their impressive show in the ODI series, they will begin this series as overwhelming favourites. New Zealand boasts a strong batting unit in skipper Kane Williamson, Ross Taylor, Tom Latham and Henry Nicholls. With 6524 and 5865 runs Taylor and Williamson are among Kiwis leading run-getters in the longest format and their respective test average of 45.31 and 51.45 are enough to prove their consistency in this version. While both Tom and Henry were in good touch during the ODI series and these two are likely to rack the big totals during the test. When it comes to bowling, the Kiwi's boasts two deadly pacers in Tim Southee and Trent Boult. Both are amongst the Kiwis leading wicket-takers in test cricket with 237 and 233 wickets and the duo is expected to make things tough for the visitors. While Neil Wagner and Todd Astle will be seen serving supportable roles in the test. 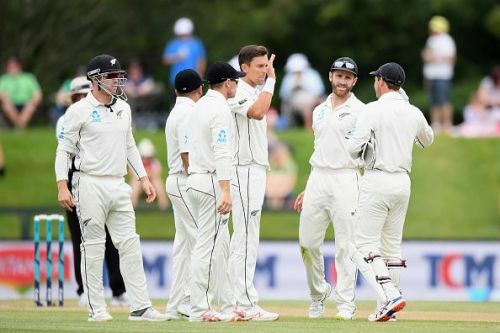 Kane Williamson (C), Ross Taylor, Henry Nicholls, BJ Watling (W), Colin de Grandhomme, Tim Southee, Todd Astle, Neil Wagner, Trent Boult, Tom Latham and Jeet Raval. Bangladesh aim to end their overseas test drought. The visitors were found wandering in the ODIs and their test record outside Bangladesh doesn't support their cause either. Till date they have played 51 test fixtures in away conditions and have managed to win just four of those, with their most recent win coming against Sri Lanka in March 2017 at P Sara Oval. Despite this they will try to take some confidence from their recent test record at home, where they whitewashed the mighty Windies by 2-0. Bangladesh batters had forgettable outings during the fifty over clashes as none of their batsmen available for Test series managed noteworthy contribution and this will be the team's major concern heading into the series. Though they will bank on the likes of their most experienced campaigners Tamim Iqbal, Liton Das and stand-in skipper Mahmudullah to make sizeable contributions with the bat, else they won't be able to challenge the hosts. Meanwhile, they found a sight of hope with Liton Das, Mahmudullah and Shadman Islam all cracking fifties in the practice match against New Zealand XI and they will be expected to make it better in the first test. Bangladesh's bowling certainly missed the services of Shakib al Hasan in ODIs and with his unavailability in the tests, they will rely heavily on the services of Mustafizur Rahman, Mehidy Hasan and Taijul Islam. Where Mustafizur was their only bowler to trouble the Kiwis in the preceding series. Rahman picked four wickets in three matches and he will be expected to cause a major dent in the opponent's lineup. While both Taijul and Mehidy have impressed the critics in their short test careers and have taken 97 and 84 wickets in just 23 and 18 fixtures respectively and the spin duo is likely to finish with best figures considering opponents weakness against the spin. Mahmudullah (C), Liton Das (W), Mehidy Hasan, Taijul Islam, Nayeem Hasan, Mustafizur Rahman, Tamim Iqbal, Soumya Sarkar, Mominul Haque, Shadman Islam and Mohammad Mithun.